Unfortunately, things are not looking good in Mali, no matter how you try to spin it, or how much you want to find a silver lining. While I still have no idea whether or not I will be moving there in June, I certainly find it hard to "plan on it." So, here I am again... back to the holding pattern. Actually, this feels a lot like the process of applying to the Peace Corps in the first place, so in some ways I am used to it. That being said, it is not where I want to be, and I would give almost anything to know where I will be in two months, and what I will be doing. Right now, that just isn't in the cards, so in the meantime, I try to put my energy into living today. For example, I (finally) started studying Cape Verdean music as the Escola Municipal de Musica. I can't explain how crucial and therapeutic just a few hours with a real upright piano can be for me. They're not exactly piano lessons since Professor Cachimbo actually plays guitar, but its still a chance to learn something new, and shake the rust of my fingers. Things are also in full swing on the football front. I've been working with Gremio Desportivo Amarante as the coach of their U-17 team. Our first game of the Campeonato was today, and honestly, heading into battle I was a little nervous. Let's just say that the struggle to instill discipline on and off the field is a marathon, not a sprint. I survived a near-mutiny in the locker room before the game, but eventually convinced the boys that we all had a role to play, and the sooner we got focused on that, the better for everyone. Translation: "I promise not to run on the field and kick the ball in the middle of the game if you promise to leave the coaching decisions to me." Fortunately, it looks like my tough love has not be in vain. They came out strong and organized today, and they dominated the game. 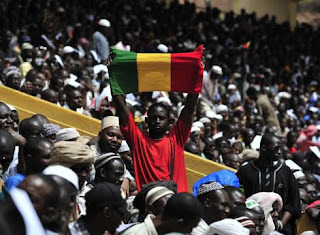 If I do transfer to Mali at the beginning of June, I will miss the last game of the Campeonato... a bummer, but all the more reason to squeeze the juice out of every Sunday untill then. Since my days here are numbered, I am constantly on the lookout for an opportunity to experience a new slice of Cape Verde. Earlier this week, we took a hike out to the lighthouse in Sao Pedro. At the end of this month I will get a chance to visit the island of Fogo, which will be a homecoming of sorts. The creole in Cape Verde is amazingly diverse, with each island sporting its own accent and slang. In some cases, as in the north/south (badiu/sanpadjudo) divide, they are legitimately distinct dialects. I, on the other hand, speak a weird, unidentifiable-but-understandable version of the language that I have recently taken to calling Drewese. You start with a few semester studying Brazilian Portuguese in college, add on nine weeks of training in Southern Cape Verdean Creole, then relocate to the North for six months. The end result? Everyone thinks I'm Cape Verdean, they just think/know that I am from some other island. So, almost everyday a Cape Verdean finds an opportunity to ask/tell me, "Abo é de Fogo? "** I'm really looking forward to visiting Fogo, if only to find out what island they think I'm from. Until then, I am living today, here in Mindelo. Until further notice, my apartment is still my home. Oh yeah, about that... my roommate, with a little encouragement, decided to adopt a kitten off the street this week, so now Mia's got a little sister/arch-nemesis. She survived here first bath, and she should live a long and happy life, as long as she stays out of Mia's food bowl. Living today means something different everyday, and that's how I've always liked it. When it's not teaching English, playing music, or coaching soccer, its just being here... with my friends, with my colleagues, and with my neighbors. My friend, Sandro, just lost his Grandfather, so I spent a lot a time with him this week. On São Vicente, it is customary for friends and family to visit on the seventh day after someone dies, so we joined him again on Friday evening. In his honor, I wanted to share this haiku that popped into my head when I got home later that night. we eat, laugh, and drink tonight. You are gone, but here. I also wanted to share a piece from a friend back home. The love from you all is what prevents my otherwise-immenent nervous breakdown. ** "You're from Fogo, right?"